She loves a bit of luxury in her life. So give her just that with some sparkle or (fake) fur. She will adore. Clockwise from top left: Feather, £1.95. Helen Moore Fur Scarf, £57. 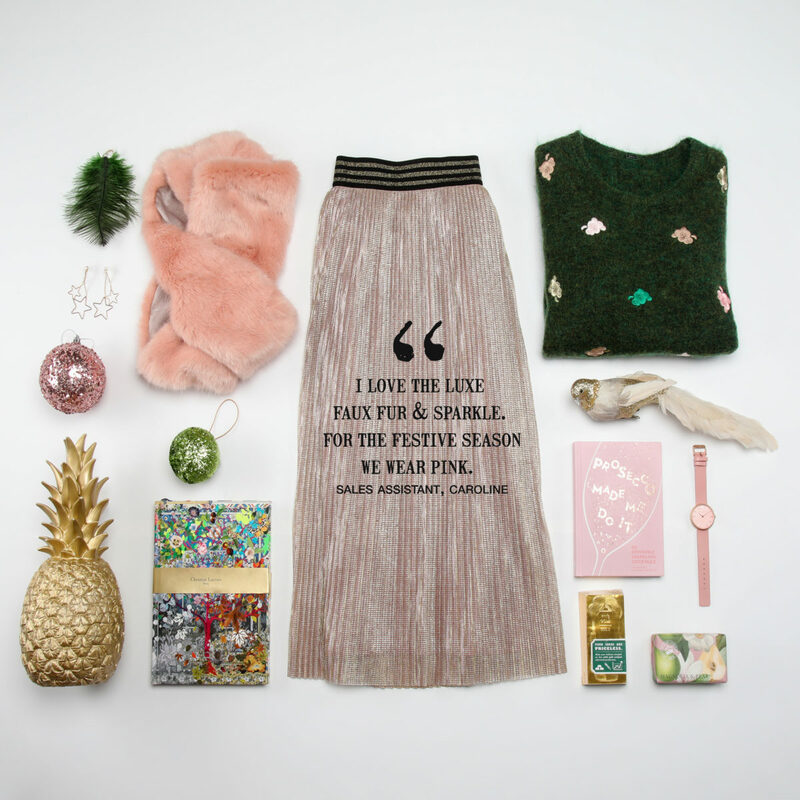 Vilagallo skirt, £110. Gustav sweater, £190. Bird, £15.50. Prosecco Made Me Do It book, £9.99. Elie Beaumont watch, £55.00. Kew Gardens Botanical magnolia & pear soap, £6.50. Your Ideas Are Precious notebook, £4.99. Christian Lacroix notebook, £29.95. Pineapple light, £89.95. Pink tree bauble, £8.25. Star earrings, £13.95. 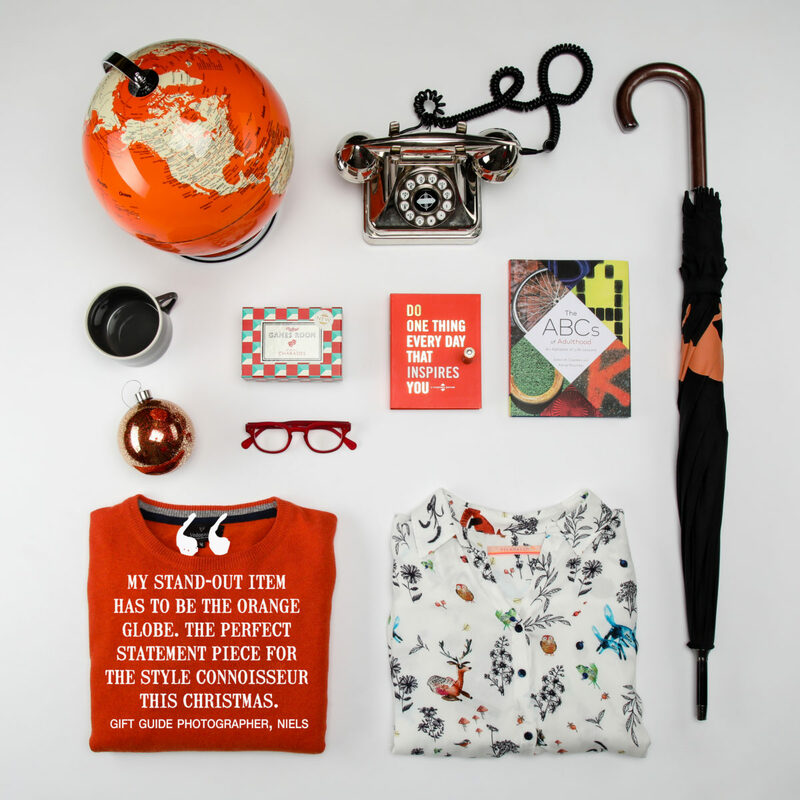 Make the itinerant intellectual in your world happy with some cleverly iconic pieces for at home and away. Clockwise from top left: Restoration Yard globe, £95.00. Lobby telephone, £69.95. Umbrella, £24.95. The ABCs of Adulthood book, £9.99. Vilagallo women’s blouse, £85.00. Vedoneire men’s sweater, £55.00. Izipizi reading glasses, £29.95. Christmas bauble, £3.00. Mug, £14.95. Charades game, £9.95. Do One Thing Every Day That Inspires You book, £12.99. Add some seriously lovely refinement to the most picky of beauty aficiondo’s bathroom cabinets with these handpicked treats that will delight all their senses. From top (and left to right): Hanging glass star, £38.95. Hydrea amssage brush, £7.50. 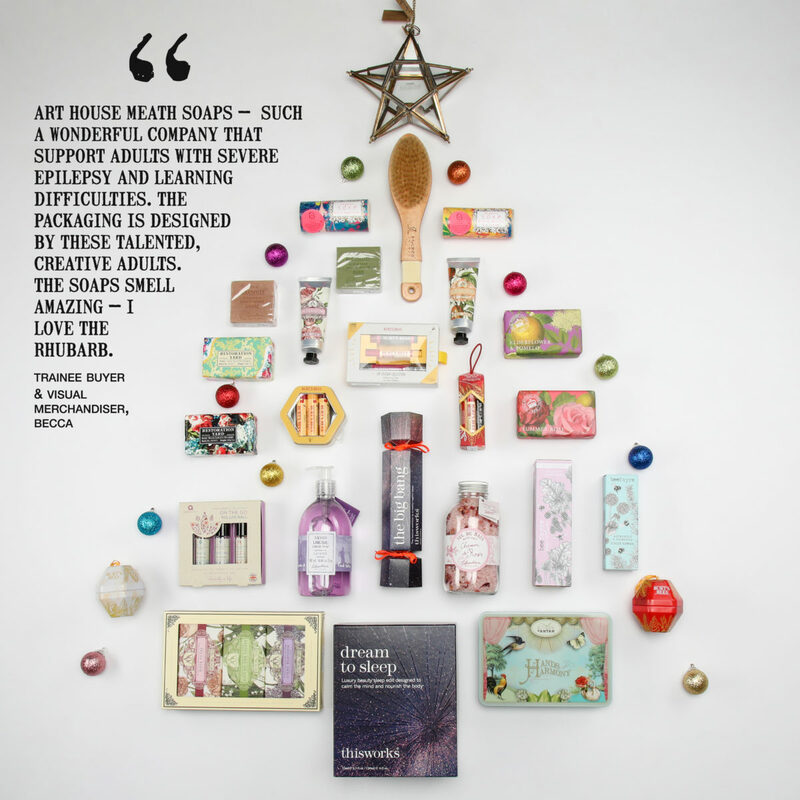 Art House Meath soaps, £2.95 each. Bar soaps, £3.50. Aromas Artisanales de Antigua floral lotus flower hand cream, £3.95. Aromas Artisanales de Antigua orange blossom hand cream, £3.95. Restoration Yard soap, £4.95. Burt’s Bees Lip Colour Kit, £14.99. Kew Gardens Botanical elderflower & pomelo Soap, £6.50. Restoration Yard Soap, £4.95. Burt’s Bees Lip Balms, £9.99. Burt’s Bees lip set, £9.95. Kew Gardens Botanical summer rose soap, £6.50. Essential Oils, £13.95. Lothantique lavender liquid soap, £11.50. Thisworks the big bang kit, £12.00. Bath salts, £10.95. Beefayre reed diffuser, £14.95. Beefayre handcream, £8.75. Burt’s Bees gift baubles, £6.95 each. Aromas Artesanales de Antigua soap set, £9.95. Thisworks dream to sleep kit, £34.00. Hand Harmony hand-creams, £20.00. Baubles throughout, £7.50 for set. Practical does not need to mean boring. 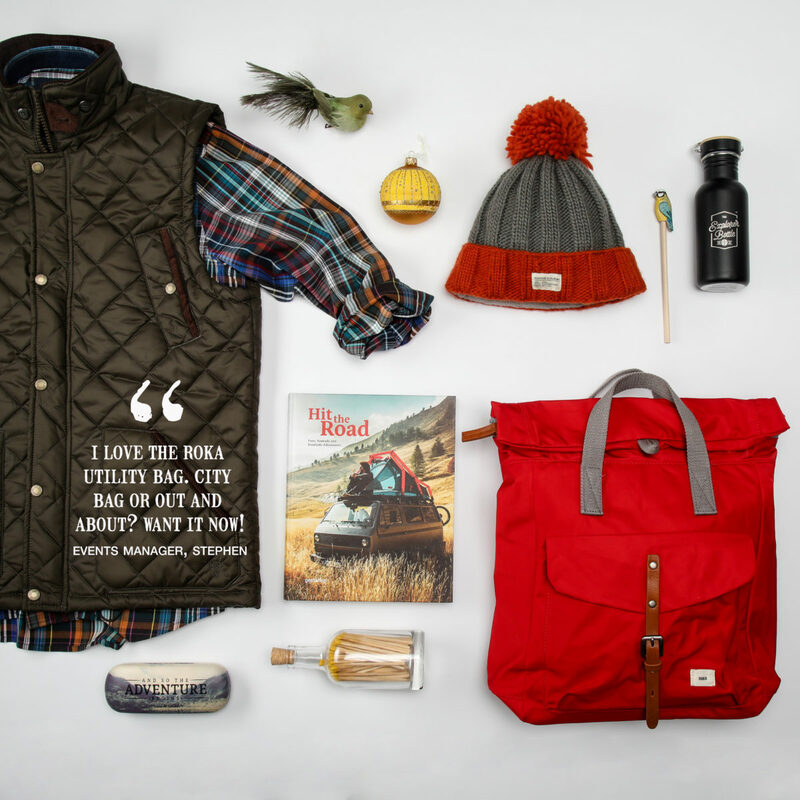 Your loved explorer deserves to enjoy their favourite external pursuits with added style plus comfort. Clockwise from top left: Vedoneire shirt, £54.95. Vedoneire gilet, £55.00. Bauble, £4.75. Kusan bobble hat, £29.00. Explorer bottle, £13.95. Bird pencil, £3.50. Roka bag, £59.95. Jar of matches, £12.00. And So The Adventure Begins glasses case, £4.95. Hit the Road book, £35.00. A bit of gardening, dog walking or trekking out with the kids need not mean saying goodbye to feeling and looking amazing. Clockwise from top left: Ilse Jacobsen raincoat, £190.00. Part Two sweater, £99.95. Salsa embroidered jeans, £175.00. Bauble, £6.95. Tretorn short welly boots, £75.00. Bauble, £6.50. Wreaths book, £14.95. Ornamental bird, £12.75. Elate your connoisseur of good food this Christmas with a selection of delicacies they can enjoy throughout and beyond the festive season. From top (and left to right): Hanging glass star, £38.95. Belvoir mulled winter punch, £3.95. 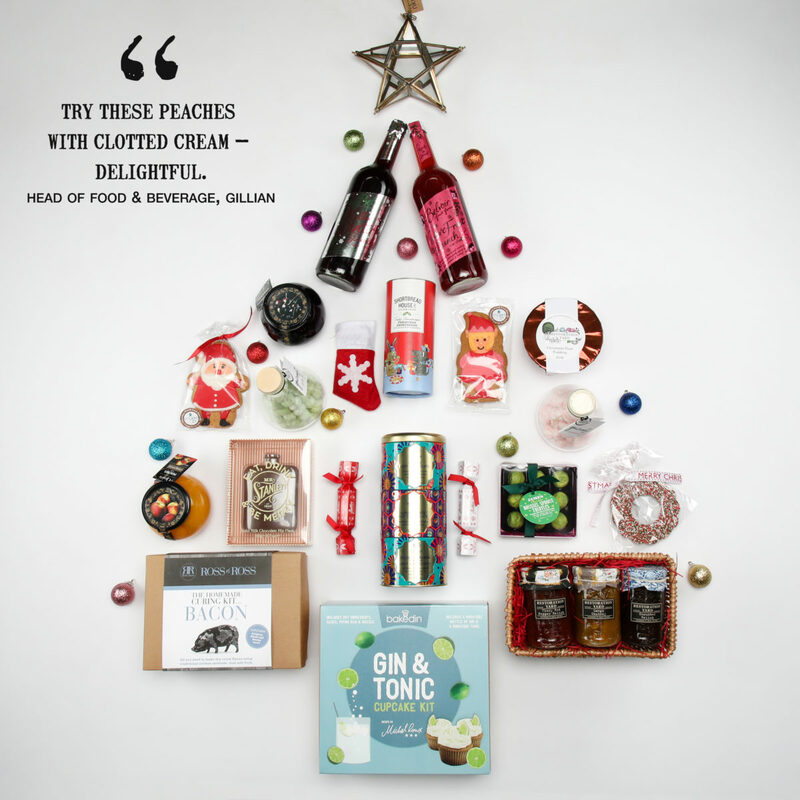 Belvoir festive fruit punch, £3.95. Opies cherries in kirsch, £7.95. Christmas shortbread, £4.95. Gingerbread santa, £3.95. The Treat Kitchen gin & tonic bon bons, £12.95. Stocking chocolate, £5.50. Elf gingerbread, £3.95. Restoration Yard Christmas pudding, £5.50. The Treat Kitchen strawberry & prosecco bon bons, £12.95. Opies peaches in Courvoisier, £7.95. Mr Stanley’s chocolate hip flask, £5.50. Whittards hot chocolate selection pack, £14.25. Butlers truffle crackers, £2.95 each. Sprout truffles, £8.95. Chocolate wreath, £4.50. Ross & Ross homemade curing kit…bacon, £22.00. Bakedin Gin & Tonic cupcake kit, £19.95. Restoration Yard chutney mini hamper, £16.95. So Christmas is all about the kids. 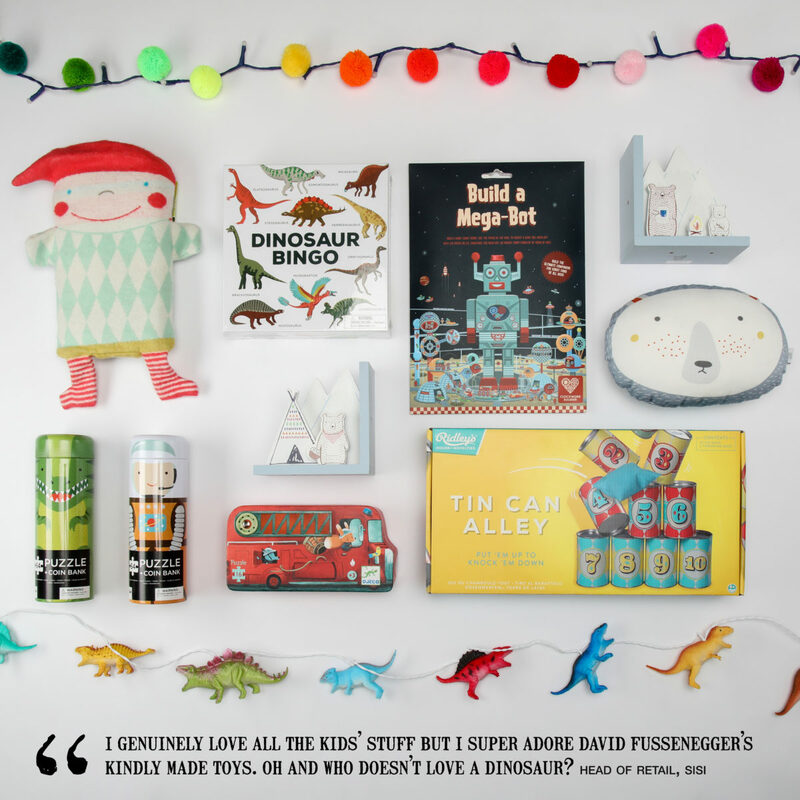 Give them joy, fun and a sprinkling of unicorn (and dinosaur) magic. From top left: Dinosaur lights, £29.95. 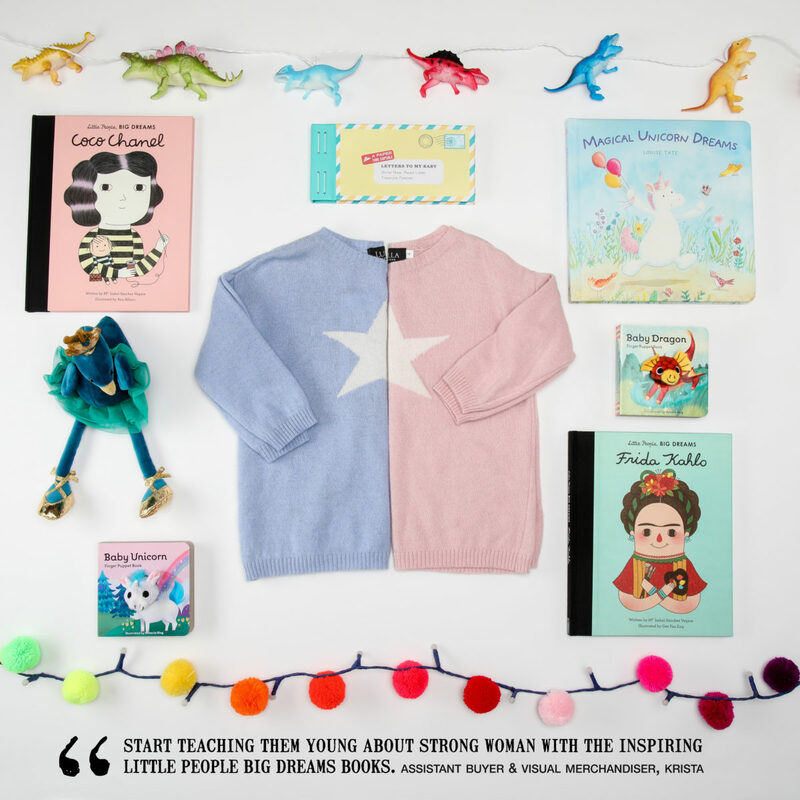 Little People Big Dreams Coco Chanel book, £9.99. Letters to My Baby book, £12.99. Magical Unicorn Dreams book, £10. Baby Dragon book, £5.99. Little People Big Dreams Frida Kahlo book, £9.99. Luella pink & blue star cashmere sweaters, £34.95 each. Baby Unicorn book, £5.99. Ballet dancing peacock soft toy, £18. Pom pom lights, £31.95. Stocking emptying on Christmas morning will see faces lit up with happiness – just add a few off-list gems that take them beyond screen time. 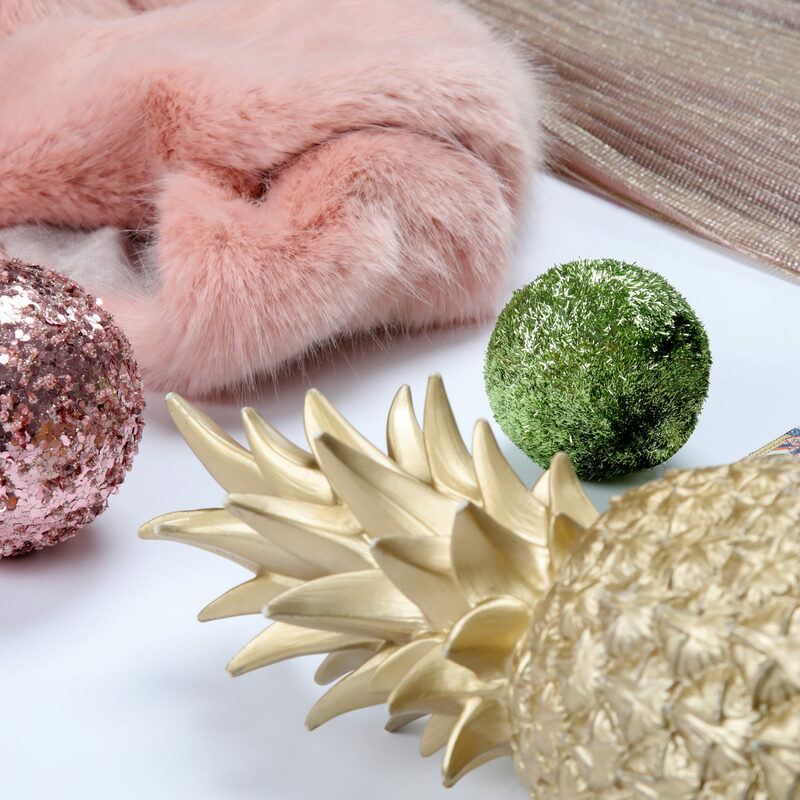 From top left: Pom pom lights, £31.95. David Fussenegger blanket, £34.95. Dinosaur bingo, £16.99. Build a mega-bot, £12.95. Book end £15.95 for set. Cushion, £15.95. Tin Can alley game, £25.00. Dinosaur lights, £29.95. Bus puzzle, £10.95. Coin bank puzzles, £13.95 each. 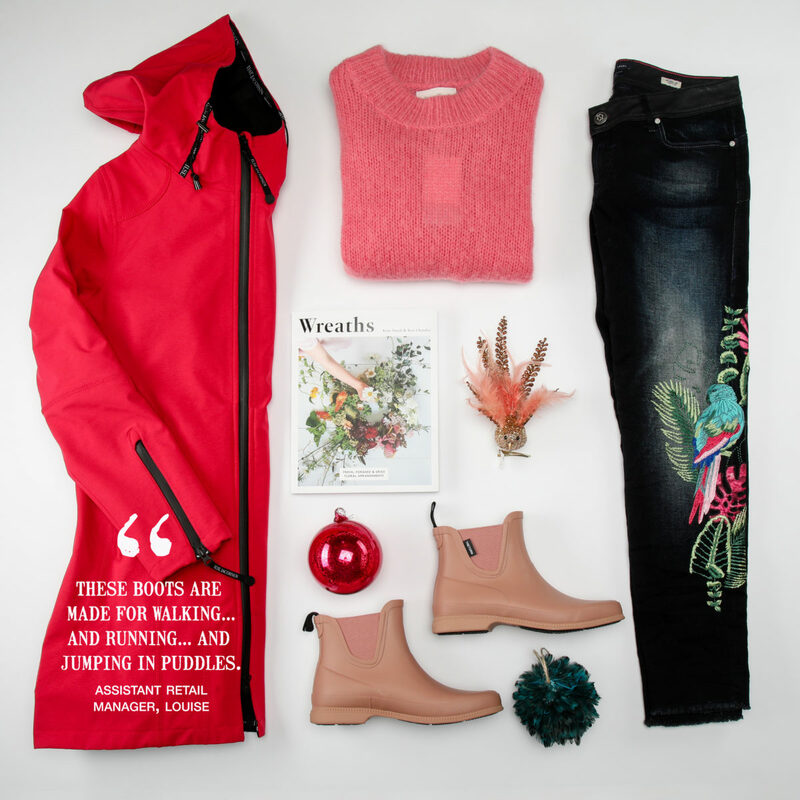 Wishing you all very happy Christmas and good luck with the gift sourcing and let us know how helpful you found our Christmas Gift Guide. RY.